Sometimes my kids see a mom who is impatient and weary. Sometimes they witness a good cry. Sometimes my kids see a woman who's distracted by thoughts they don't quite understand. Sometimes they catch a glimpse of how grown ups experience hurts too. Sometimes my kids watch as I fret and worry over things I cannot change. Sometimes they observe their parents wrestle with the questions and the answers too. And so often we think our kids need us to be brave only. Be consistent invariably. Be right absolutely. Be faithful faultlessly. Be wise undoubtedly. Be happy seamlessly. We can try to be all those things at all times, but because we simply can't in our fallenness, to do so may simply be to inspire superficially. And there's really nothing more worthless to me than to encourage my kids with hope that is merely skin-deep. But to go further than skin-deep is to cut through the fleshy, the marrow, the lifeline; it's to bleed the Truth, pretty or otherwise. 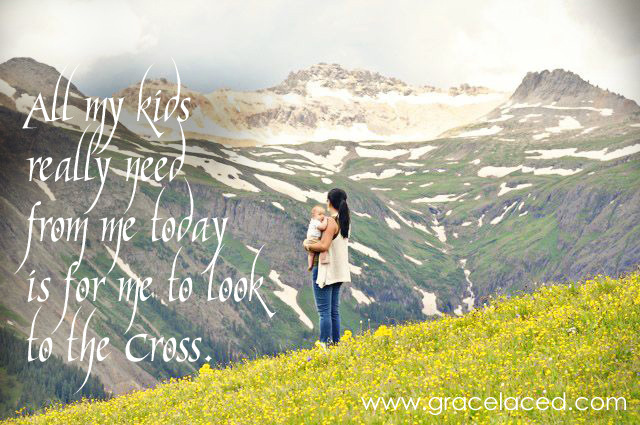 So I'm learning this day by day: All my kids really need from me today is for me to look to the Cross. For me to point my life Christ-ward. To fix my gaze upon the beauty of the Redeemer. "What is she looking at?" they will ask. "What is so pre-occupying, so mesmerizing, so wonderful?" And they will take their eyes off themselves, their immediate desires and disappointments, and crane forward to get a better view of what it is that captures my mind, my heart, my longings. ...then your RESCUER is the Lord God. We need not look elsewhere for hope, help, or holiness. That's what they really need from you and from me today.